I could not leave Saltillo quickly enough – unbelievable how fast humans had destroyed this recently still mostly quiet and beautiful part of the world. It seems as though the authorities had decided to sacrifice this valley to create economic wealth as there was enough nature near by that was so large and unspoiled that it would serve its purpose. Of course, cactus explorers are notoriously lazy, so that if you plot the historic type localities and recent field number listings on a map, you end up mostly with the road map of that particular area. We are no different. But as the present situation here now shows, these are also the first places to be sacrificed for human economic development. Back to the cacti. First stop of the day was S3072, in the middle of nowhere with a small uninhabited small holding to the south, along MEX 40, the Saltillo – Torreon road, near Rinco Colorado. As this was a Thelothon, it was good to see Thelocactus bicolor with buds about to burst into flower. And again there were lots of other cacti to admire. Just an initial list to whet the appetite, with more details to follow once we had a chance to consult literature back home, in the order that they were photographed: Opuntia rufida, Cylindropunia leptocaulis, still trying to staple our trousers to our legs, or in Cliff-in-shorts’ case, to use his legs as a pin cushion, Echinocactus horizonthalonius – I don’t recall having seen them so full of water before in nature; some looked round like footballs! And with signs of budding, so may be in flower when we complete the loop and pass by here again in just over a week. 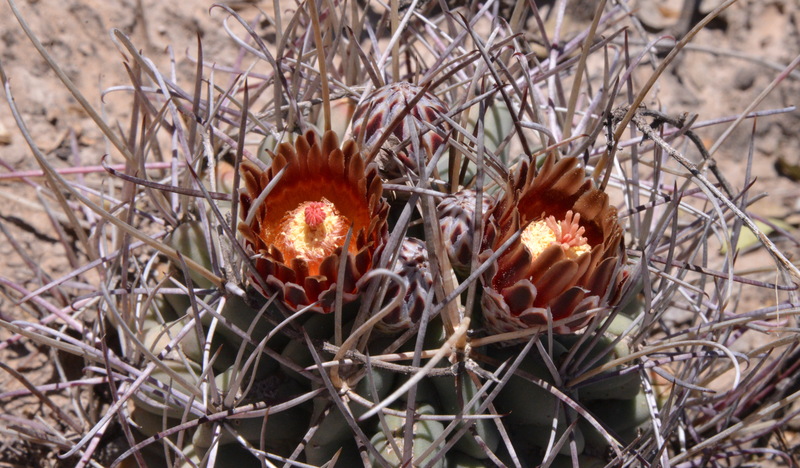 I have already mentioned Thelocactus bicolor in advanced bud – just a matter of hours before fully open. 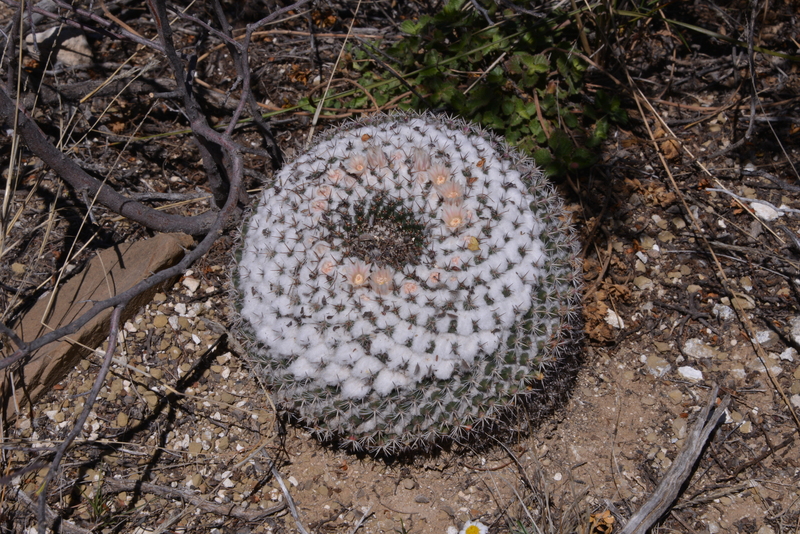 Astrophytum capricorne was here too, difficult to take an attractive picture of this plant as the dense bird’s nest like spination made it difficult to appreciate the beauty of the white flecking on dark green epidermis – good sun block though! There were large clumps of what I assume to be Echinocereus stramineus, a large stemmed Echinocereus sp that on previous trips we’ve been calling E. dubius, an epithet that would fit many other taxa in other genera as well, for various reasons and a Coryphantha that will have to remain ‘sp.’ for now. Mammillaria pottsii put in an appearance or two as did Ferocactus hamatacanthus, Epithelantha micromeris and a group of Mammillaria lasiacantha with several heads in flower – good spot Ian! Most of these plants – though not all – were also present at today’s remaining stops: S3073, S3074, S3075 and S3076, with the latter christened as The Dead Dog stop as it appears a pet had been killed by a passing car and had been kindly put in bags to protect it from vultures etc. As we opened our car doors, the smell was horrendous! By the time we reached S3073, for which SatNav gave the address General Cepada – La Rosa, most of the Thelos had opened their flowers – very nice, thank you Thelos. 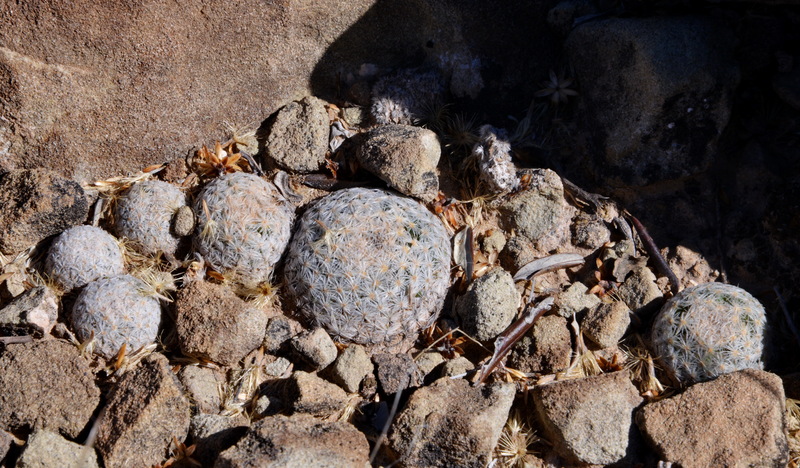 There was also an Ariocarpus retusus here, just the one, with Cliff, farther along the hill, finding more. We passed through the village of General Cepada (I took the picture of the church – no one wants to see non stop cacti in a talk) and made the remaining stops of the day. 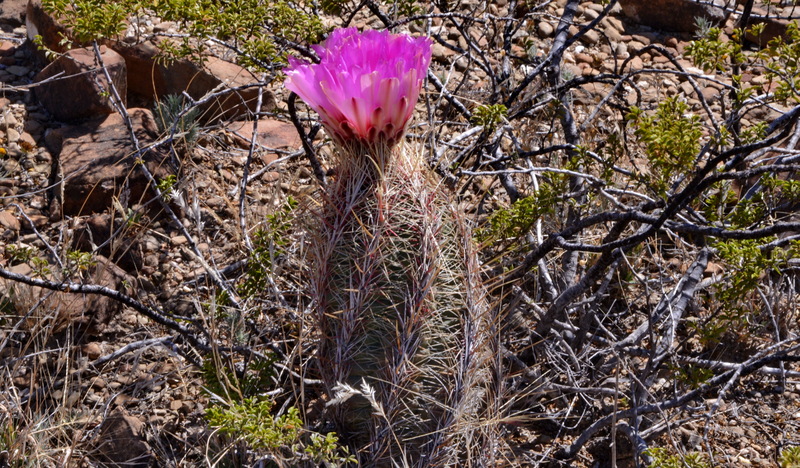 S3075 again on the General Cepada – Parras road: Cylindropuntia sp, Echinocereus enneacanthus, Mammillaria sp, Opuntia rufida, Opuntia sp. Sclerocactus (Ancistrocactus) uncinatus. 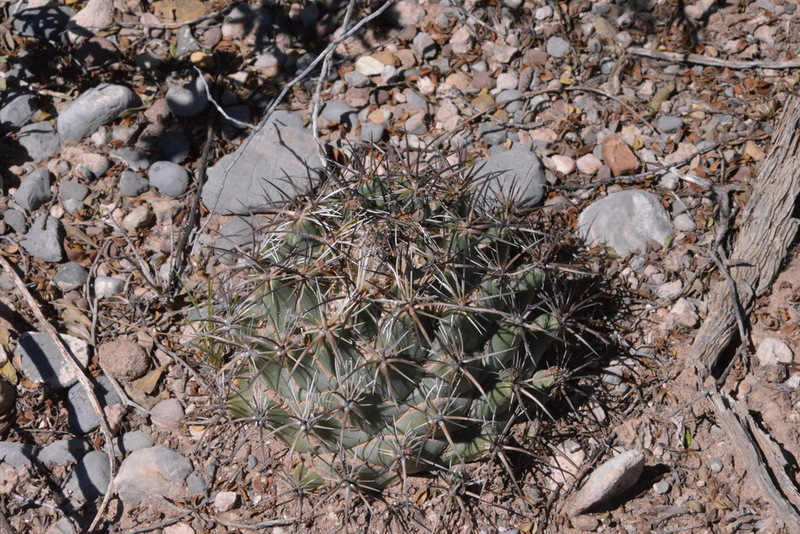 S3076: still along the General Cepada – Parras road: Astrophytum capricorne, Coryphantha clavata (?) 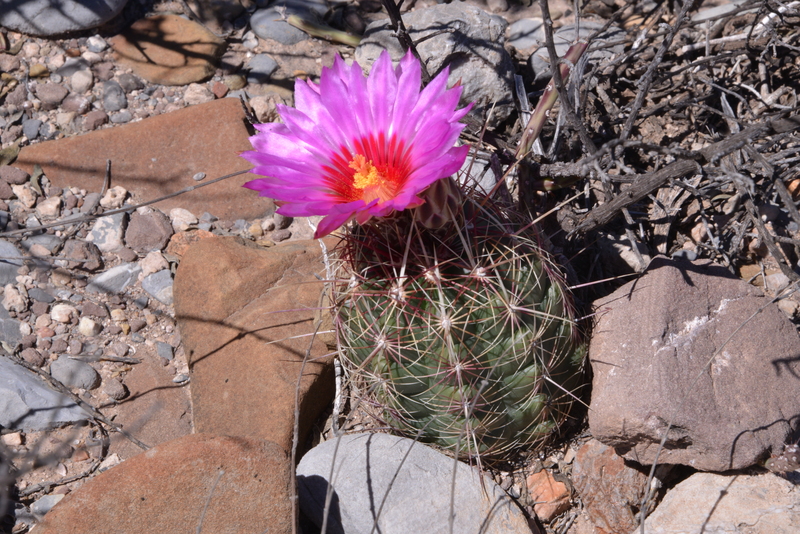 Echinocactus horizonthalonius, Echinocereus longesetus, Ferocactus hamatacanthus, Mammillaria pottsii, Thelocactus bicolor ssp bolaensis.